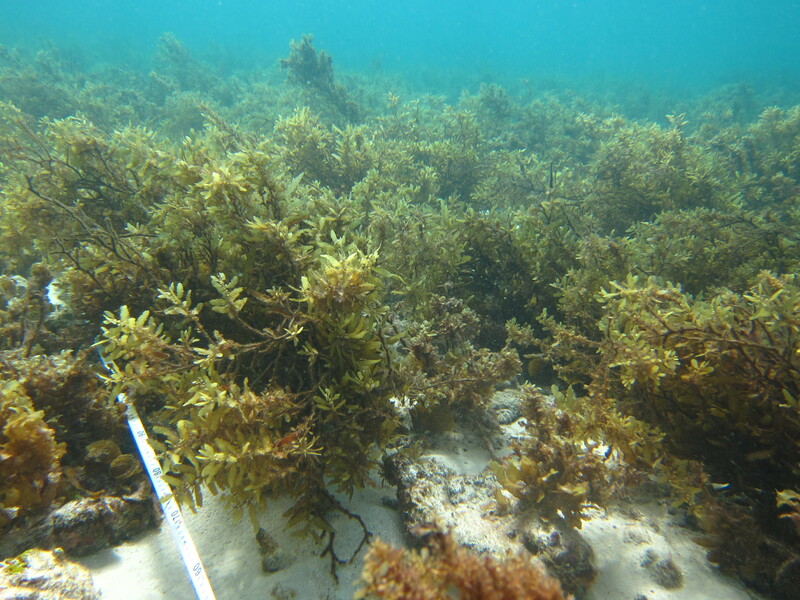 In this post, David Angeler discusses a paper he recently handled by Kirsty Nash and colleagues “Herbivore cross-scale redundancy supports response diversity and promotes coral reef resilience” This paper will appear as part of a forthcoming special profile ‘Quantifying Resilience’ in Journal of Applied Ecology. We are living in a time of spurious certitude. The unprecedented transformation of the biosphere is shown by rapid changes in ecological, social, technological and economic systems. Can societies and ecosystems keep pace with these changes? The concept of resilience, introduced more than 40 years ago in the ecological sciences, has gained popularity among academics and layman alike, as a way to answer this question and approach these intricacies. There is no doubt resilience has become a buzzword in recent years, as shown by its increasing appearance in calls for research proposals and scientific citation databases. But do we actually know what it means? Or, more importantly to us ecologists, can we use it in a practical manner for management and conservation? Cote D’Or Reef on Praslin Island, currently in an algae dominated (degraded) state after a bleaching event in 1998. Credit: Karen Chong-Seng. The original definition of resilience forwarded by C.S. Holling in 1973 is the most useful: the amount of disturbance that a system can withstand before it shifts into an alternative stable state. The idea of alternative stable states has clear and profound implications for ecological management. Coral reefs, for instance, are high diversity areas that provide key ecosystem services such as fisheries and coastal protection. However, human impacts are causing significant, ongoing reef degradation, with some reefs shifting from coral to algal-dominated states in response to pressures such as elevated water temperatures and overfishing. 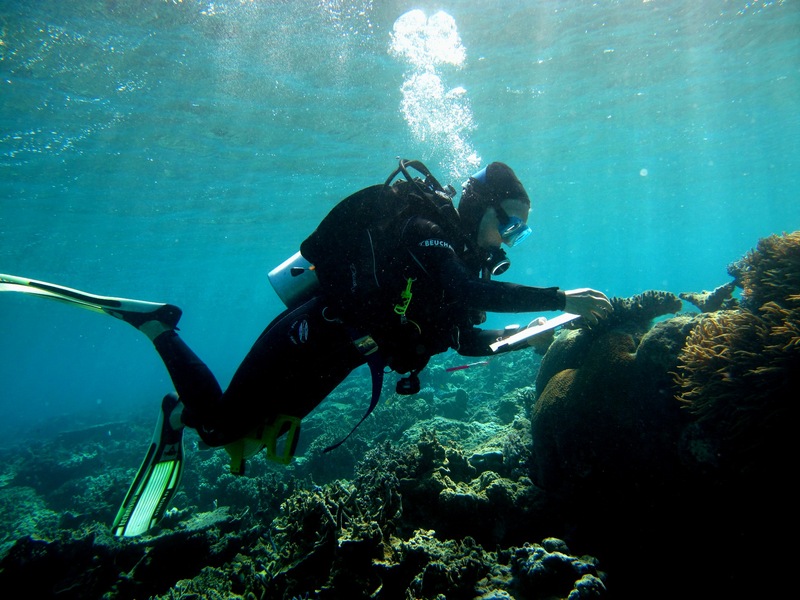 Understanding and discerning between the factors that help maintain reefs in a coral-dominated state vs those that facilitate a shift to an undesired algal-dominated state is a critical step towards sound management and conservation of these important ecosystems. Ile aux Vache Reef near Mahe Island, recovering to a coral dominated reefs after the 1998 bleaching event. Credit: Nick Graham. In a recent paper in the Journal of Applied Ecology, Nash et al. (2015) provide an elegant example of how coral reef resilience can be assessed after a temperature-induced, coral bleaching event. 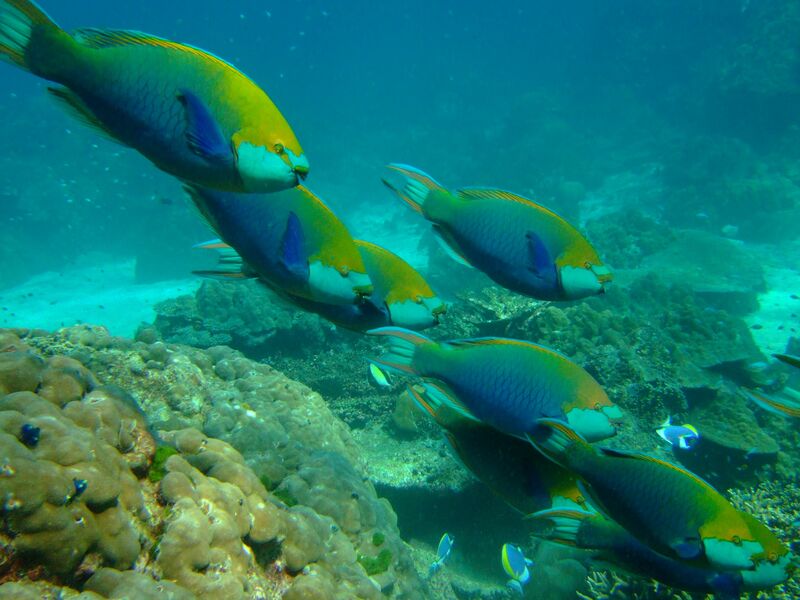 The authors studied herbivorous fishes that feed on and remove algae; monitoring these fishes at 21 reefs in the Seychelles before (1994) and on two occasions after (2005, 2011) a major bleaching event in 1998. 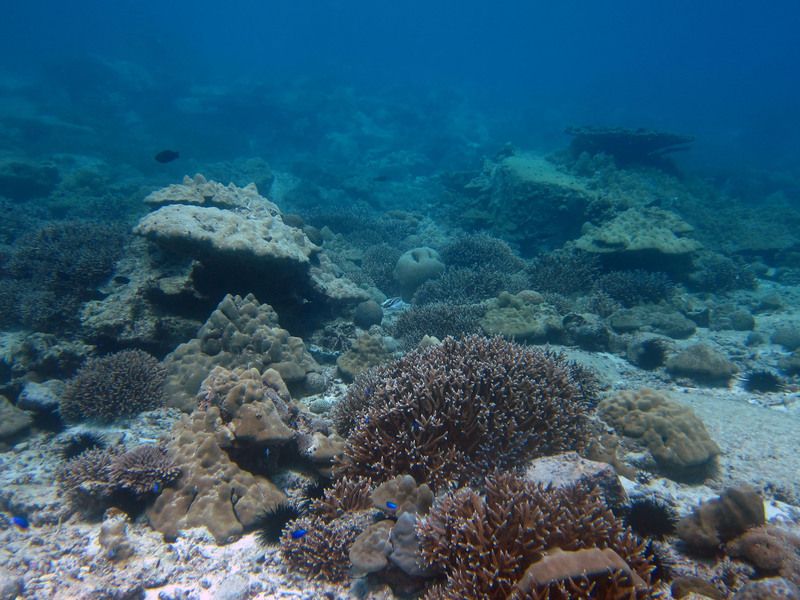 This disturbance caused a loss of more than 90% of the coral cover on some reefs and the authors were especially interested in how the functional attributes of herbivorous fish, such as foraging behavior and body size, support reef recovery. Assessments of the functional attributes of communities are increasingly being used in the evaluation of environmental change outcomes, and Nash et al. elegantly combine this approach with ecological scaling theories to provide a refined picture of community responses to environmental perturbations. Accounting for scales is especially relevant in resilience assessments because the magnitude of environmental impacts can be scale-specific. Their approach uses body size as a proxy for the spatial scale at which fish remove algae from the reefs. That is, body size is a good indicator of how fish interact with their environment in terms of resource and habitat use, with larger fish generally exhibiting longer foraging movements than their smaller-bodied counterparts. It has been proposed that when functional groups of fishes such as herbivores operate at distinct scales, known as “cross-scale redundancy”, they may be better able to cope with disturbances because fishes that feed over different spatial scales respond differently to these disturbances. Ecologists refer to this range of responses as “response diversity”. Kirsty Nash in action on the coral reefs. Credit: James Tan. Nash et al. tested this proposal and found that on reefs where the herbivore assemblages prior to the bleaching event were made up of fishes covering a wider range of body sizes and thus that operated over a broader range of spatial scales, the reefs were more likely to recover to coral-dominated states after the disturbance. In this case, after the temperature-induced disturbance, the loss of small herbivores was compensated for through increases in large herbivores. Large fish were needed to ensure response diversity resulting in control of algal growth and avoiding the consequent decline to an algal-dominated state. Scarus prasiognathus, a large herbivore showing increased biomass following the bleaching disturbance. Credit: Kirsty Nash. Such compensatory dynamics were not evident at sites where herbivores operated over narrower ranges of spatial scales; that is, when cross-scale redundancy and response diversity were low. Nash et al. concluded that cross-scale redundancy provides managers with a practical indicator of coral-reef resilience. This conclusion is not only relevant for understanding responses to bleaching events but for management at large; in a fisheries context, their results suggest that balanced harvest regimes may help maintain high cross-scale redundancy at a given site to avoid disproportionate depletion of certain size-classes of reef herbivores. Managing for high cross-scale redundancy will increase response diversity and help coral reefs stay away from undesired algal-dominated states. The work by Kirsty Nash and her coworkers shows how resilience can be moved from a buzzword to a measurable ecological concept of management relevance. It will appear as part of a forthcoming special profile in Journal of Applied Ecology on the topic Quantifying Resilience. Stay tuned!